Imagine the on-track excitement of world-class racing with crowds of racing fans cheering their favourites past the finishing post. Enjoy the thrill of a winning bet through easy-to-access betting information and facilities and share the pageantry of the race with friends in a choice of restaurants and catering facilities. Special theme races are held throughout the racing season to add that extra flair and variety for racing fans. 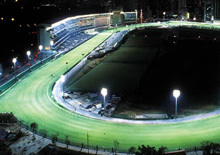 Choose the scenic country setting surrounding Penfold Park at Sha Tin Racecourse or the dramatic cityscape environment of the Happy Valley Racecourse. With world-class racing stars competing for some of the richest stakes in prize money each season, racing entertainment has never been so exciting. The public transportation system in Hong Kong is among the best in the world and therefore getting to and from the racecourses is never a problem. Whether by taxi, bus, MTR, tram or on foot, you will find that you can make it to the races in record time.